Instant Car Donation was founded with the goal of bringing donors and local charities together with an efficient and pleasant process. You can focus on deciding which of our respected charities is right for you instead of worrying about difficulties of researching how to make a donation. After your free pickup, we will assist you in recieving the best tax benefit possible for your generous gift. We take pride in helping smaller charities easily receive car donations, bringing people together while helping support those in the Boulder, Colorado community who need it the most. Here are some of our favorite charities in the Boulder area. We have made sure each of them are eligible for tax deductions when you help your local community by donating your car. Your values and choice can make a difference. Founded in 1985, the mission of Boulder County AIDS Project (BCAP) is twofold: to provide support, advocacy and education to those in our community who are infected with or affected by the Human Immunodeficiency Virus (HIV) and to serve as an outreach and information center to prevent further transmission of HIV and the resulting Acquired Immune Deficiency Syndrome (AIDS). Boulder County AIDS Project (BCAP) serves men, women and children who are HIV positive living in Boulder, Broomfield, Clear Creek and Gilpin Counties. All care services are free, confidential and offered within a non-judgmental environment. Care services include case management, access to medical care, financial assistance, food bank, volunteer support, support groups, and pro bono professional support services. The Davis Phinney Foundation's provides essential information, practical tools, and inspiration to people living with Parkinson's and funds research closely aligned with our mission. While it's critical to find a cure for Parkinson's, we feel strongly that people living with this disease need information and tools to live well today. The Foundation was founded in 2004 by Olympic medal-winner and cycling great Davis Phinney, who was diagnosed with Parkinson's in 2000 at the age of 40. We are committed to supporting programs and research that deliver inspiration, information, and tools that will enable people with Parkinson's to take more control in managing their disease. eTown is a weekly radio show featuring performances by top musical artists and conversations and information about the world around us. Now in it's 24th year, eTown's mission is to educate, entertain and inspire a diverse audience, through music and conversation, to create a socially responsible and environmentally sustainable world.Each week, the show honors an eCheivement award winner nominated by our listeners. These individuals are champions of social responsibility and environmental sustainability, making a difference in their community.The show is taped in front of a live audience at eTown Hall, the greenest music, media and community center in Colorado. eTown can be heard on NPR, public and commercial stations nationwide. Founded in 1970, the Native American Rights Fund (NARF) is the oldest and largest nonprofit law firm dedicated to asserting and defending the rights of Indian tribes, organizations and individuals nationwide. NARF's practice is concentrated in five key areas: the preservation of tribal existence; the protection of tribal natural resources; the promotion of Native American human rights; the accountability of governments to Native Americans; and the development of Indian law and educating the public about Indian rights, laws, and issues. Throughout its history, NARF has impacted tens of thousands of Indian people in its work for more than 250 tribes. River Network empowers and unites people and communities to protect and restore rivers and other waters that sustain all life. Founded in 1989, Western Resource Advocates (WRA) is an environmental law and policy organization dedicated to protecting the West's land, air, and water. Our lawyers, scientists, and economists advance clean energy to reduce pollution and global climate change; promote urban water conservation and river restoration; and defend special public lands from energy development and unauthorized off-road vehicle travel. We collaborate with other conservation groups, hunters and fishermen, ranchers, American Indians, and others to ensure a sustainable future for the West. Car donations are the method for individuals to make a charitable donation. Due to this, one of our main aims is to enable those electing a decision by ensuring that the automobile goes to the charity that best reflects their values, such as International Mountain Bicycling Association. We consistently make charity decision an essential part of the process when donating together with us. If you need us to decide for you which charity would be helped the most instead we can do this too. It's important to Instant Car Donation which you receive the greatest tax deduction benefit possible without needing to navigate complexities or perform extensive research. We all of our 501-3C non-profit charities that are participating to verify your donation would be tax deductible. The process will be streamlined for both you and the charity of your own choice. We will help a 1098-C tax form to you following your contribution that is finished. There are lots of non-profit organizations, such as Humane Society of Boulder Valley, in your local Boulder, Colorado area which may benefit from your vehicle donation. We not only assist you donate to a charity, but we focus on supplying local non-profits that are small with an effortless method that they can focus on their work to accept donations. The donation is likely to make the difference for these non-profit organizations, for example Attention Homes, while helping to support those within their local Colorado community who want it the most bringing people together. In case you have a charity in mind you would like to donate to, then you can donate with us. When there are lots of advantages to charities that receive donations from individuals, the benefits to the you, the donor might not be too apparent. The largest benefit that the majority of individuals hear about is your opportunity for a tax deduction. There are some limitations on this kind of deduction, which means you may choose to talk to a tax professional before making the donation. One more advantage of donating a secondhand car to charity is your chance to simply eliminate the car, like a Buick Coachbuilder, without having to try to repair or sell it. Most charitable automobile donation plans will anyhow vehicles whether they're operating in need of repair. Car donation programs are becoming popular in Colorado over the past decade or so, as more charities are searching for new and creative methods to create funds. Nowadays, the number of charitable automobile donation programs is in the hundreds or even tens of thousands. In case you've got a favorite Boulder charity you prefer to make donations to, it is most likely possible for that charity to get at least a portion of the funds if you give your old vehicle, like your Nissan Rogue. Aside from the charitable tax deduction and not with the hassle of handling an old car, like your Alan Autosports Sport Edition, the sensation of being able to assist those in need may be the ideal reason to donate your car, such as your Fiat 500L, to a charity. Most used automobile donation programs will sell your vehicle to raise funds for your cause, utilize the vehicle, such as a Isuzu 1-280/350, in the everyday operations of their organization, or provide the car, like your Lincoln Navigator, to a someone who needs help either at no cost, or for under the fair market value. Charitable vehicle donation programs allow you to donate your used auto to the charity of your own choice. Visit our charities page to decide on a charity in Colorado to contribute to. When you choose to generate a donation of a used car, such as your Volvo 760 Series, when the charity sells the vehicle for more than $500 they need to send you a receipt which allows you to deduct the sales cost of the automobile on your tax return. If the old car you chose to donate is not worth at least $500, then the IRS allows you to determine the reasonable market value. This is actually the value that someone would be happy to spend money on the automobile if purchasing it from you. In order to receive the tax deduction, so you will have to itemize your deductions on your tax return. You claim the tax deduction, along with the charity gets to use the vehicle sells it and uses the proceeds for the benefit of the charity. That's a wonderful thing for everybody involved. Can there be a financial tax benefit for donating my car in Colorado? We can guarantee your automobile, like your Cadillac Commercial Chassis, goes to a charity, like Boulder Jewish Community Center, that's qualified to receive tax deductible contributions and help you recieve a reciept on the contribution. You may be able to get a tax benefit for your vehicle 18, if you itemize your deductions. For contributions around $500 you can use Kelley Blue Book and to get larger contributions the non-profit organization, like eTown, needs to verify what they recieved for the auto donation (more information). 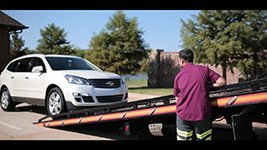 We'll organize a tow truck to come get your car and send it for you. It could not be easier to help your non-profit organization of your choice today! We take cars and trucks in all states! Go to the form and submit your request to contribute, and we will see what we are able to do for you. Can you help me locate a charity that is suitable for my personal values? We would really like to assist you ensure that your donation goes to a cause in Boulder you care personally about by helping you pick a non-profit organization, such as Boulder County AIDS Project, that fulfills with your values. This is so important for us we do so each time you donate with us! What charities do you support in Boulder? Instant Car Donation proudly supports many respected local Boulder organizations that are nonprofit in the area. Our Boulder team works hard for you to ensure the organizaion gets support from your automobile. All owners around the car title must finish the part of the title labeled "assignment of title by owner" or "transfer of ownership by seller". Most states require printing and signing owner names. You need to fill out any areas that need documentation concerning a buyer/purchaser/transferee with info. You might find detailed directions for your house state here. First we will contact the non-profit organization, like Global Greengrants Fund, of your choice (or pick one for you if you asked that rather than picked) to make sure they need your vehicle, such as a Oldsmobile Regency, which takes about one business day. Wewill arrange to get a tow truck to come for simple pickup. When it's taking a bit more time don't hesitate to give us a call. Donations to schooling charities: $59.77 billion, or 15% of all donations, went to schooling charities. This was up 3.6 percent from 2015. Donations to bases: $40.56 billion, 10 percent of all donations went to foundations and were up 3.1%. Donations to health charities: $33.14 billion, or 8% of all donations went into medical charities, which had been a 5.7 % increase. Donations public advantage charities: $29.89 billion or 8 percent of all donations went to society and public benefit charities, which had been up 5.8 percent. Donations to the Environment and Animals:$11.05 billion or 3% of all donations went to Environment/Animals, up 7.2 percent from 2015. Ultimately, the greatest percentage of contributions in 2016 moved into Religious Organizations: $122.94 billion, went to religious associations, or 32 percent of all contributions. Since you may see, charitable donations are increasing, which is a good thing as our favourite charities, like Plymouth Champ want as much assistance as they can get! In Instant Car Donation we are doing our part to boost charitable contributions through automobile donation. You can donate any type of car, such as a Bakkura Mobility Bakkura Mobility. It is an easy method. It's possible to donate your car, whether its a Nina 4 Door Sedan or a Chevrolet Military Truck to assist a nonprofit of your own choice, for example Chapman School of Seamanship, only fill out the intake form and we'll be in contact to take good care of the procedure. Once you give a car, such as being a Geo Storm, you are joining the countless Americans who subscribe to charitable causes annually. You may think that you do not have the money or resources to genuinely contribute to a cause you to rely on. But, donating a car is on the of the most effective ways which you can add your support your favourite local charity, such as eTown in Boulder, Colorado. Although it's a little action, your community in Boulder, Colorado and beyond will thankyou! Charitable giving is a portion of their American fashion, and Americans are very generous to charitable causes as a whole. In fact, at 20-16, charitable lending was measured about 390.05 million dollars, or 2.1 percent of the GDP for the exact same year. It is likewise reported that charitable giving has grown year by year almost every year since 1976. Even more surprising is the fact that young people today give even more than their grandparents did, even when they were the exact same age. Are you really amazed that Americans give so far and in lots of ways? You may ask yourself, how can you best talk about the tools you have to help make the neighborhood community you are living in a better place? For those who have a car, like a Mitsubishi Eclipse, that you aren't using, or can be only sitting on your own garage or driveway, why do not contribute for a charitable cause? Whether your car be old or new, running well or needing to another lifetime, you'll be able to donate it to the charity of one's choice farther its important mission. Notably, small and moderate sized non-profits such as Davis Phinney Foundation come in need of extra funds in order to enhance their reach into the local community. Charities like Attention Homes in Boulder, Colorado, are always in need to windfalls to grow or enlarge their charitable pursuits. When you donate your car, you breathe new life into these important apps, while you can help them receive abrupt new financing. Giving must be simple, but if not it? To give your vehicle, all you have to do is go through the donate button. We will contact you to arrange a free pickup for the car in Boulder, Colorado or the local location. . All you have to do is inform us which respected charity, such as for instance A Chance to Change Foundation, you would like to benefit through your contribution, and we're going to look after the remainder. We partner with not only each of the thousands of charities listed on our site, but should you wish to enable a charity that people don't currently list, we'll enter touch with that charity for you in order to fill out the contribution process. We will even give you with paperwork that will help you get the maximum tax-deduction for the donation! Donating your vehicle is a winwin each moment!